I was just exploring a box of old memories when I came across some Peruvian currency. There were several 1000 Intis notes in the box. I was curious just what the value of these notes were. 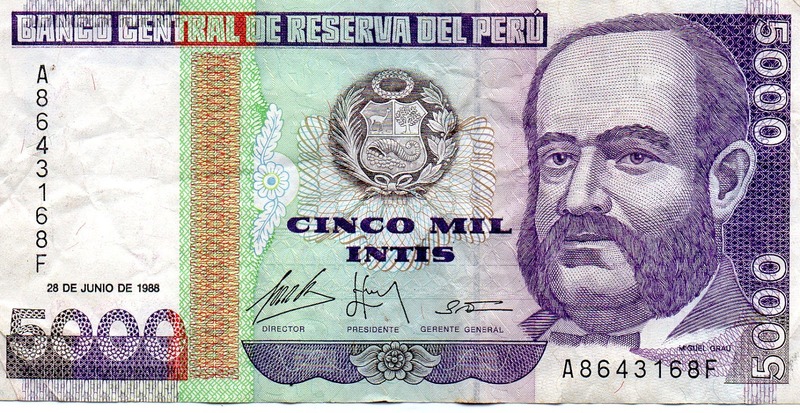 So I checked on line and discovered that the Intis are no longer the currency of Peru. In the late 1980's I traveled to Peru to adopt a child. I have never been to any other country except Mexico and did not know just what to expect. When I first got to Lima I notice that on about every corner there was a person waiting with a large roll of money. I soon learned that these were money changers. They were very busy. In fact they had lines of people waiting to do business with them. They both bought and sold currency. This struck me as odd. Later I learned about hyper inflation. We stayed in Mira Flores which was an up scale section of Peru. The first night in town we went out to dinner. Because we were rushed the next day and we had liked the restaurant, we went again that next night. I looked at the menu and the prices had gone up. I asked about the increase and the waiter look at me funny. He then explained that the prices go up every day or two. 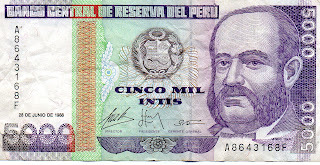 Later I asked further and discovered that no one held the Peruvian currency a minute longer than they had to. If you needed to buy anything, you went to the corner and purchase the amount of currency that you needed and only that much. I can not remember the exchange rate exactly, however the inflation rate was in the neighborhood of 7000%. If 1000 Intis could buy a loaf of bread, next week it would take 5000 Intis. We stayed in Peru for three months while the adoption took place. During this time I learned some of the strategies that people used to cope with the devaluation of the currency. There was a spread, a difference between the buy and sell rate. If I was buying Intis I could get 750 intis for one US dollar. If I was selling Intis it would take 775 intis for one US dollar. This was like an added tax to every transaction. You get paid and convert your money. You pay the spread. Then you need something and buy Intis and your pay the spread. This resulted in the fact that anytime people got money, they bought something they needed. I met a taxi driver who was building a house. He would immediately convert any currency into building materials. He would buy a dozen bricks at a time. He needed thousands of bricks but anytime he had money he bought as many as he could get. People stockpile toilet paper. They stockpiled anything that they had to have regularly. People bought and kept gold and silver. There was a spread associated with this but they hoped that the price of gold would go up and off set the spread. When they purchased something that they did not use very often they purchased as little as possible. I witnessed a student go into a stationary store and purchase 4 sheets of notebook paper. Most commonly people would convert the Intis into other currency. In the United States we have experienced inflation. Inflation erodes the value of money. You can look at it any way you want. The price of something went up or the value of the money went down. It's the same thing. In 1970, I worked at a gas station and the price of a regular gallon of gas was around 25 cents. Now a gallon of gas is around $3.50. The gallon of gas has not changed. Its the value of the money. Now it take more money to buy that gallon of gas. In the US we have benefited from a reduction in the cost of goods. This has been a hedge against inflation. Take the hand held calculator. In about 1972 a friend of mine purchased a hand held calculator and paid $152. Now you can basically get them for free. This has happened across the spectrum of consumer products. Can we expect for this to continue? When it all said and done there is one thing that I simply do not understand. Let's say today it costs you $2000.00 a month to live and in a year prices have gone up and it cost you $2500.00 a month to live. Most people would complain. However, if your boss who is paying you 2500.00 a month tell you that your pay is going down to $2000 most people would riot.